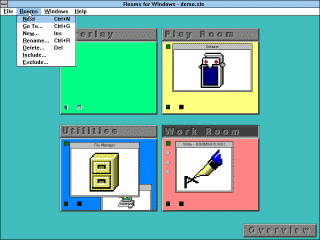 Recently Bitsavers added Rooms for Windows to their archives. 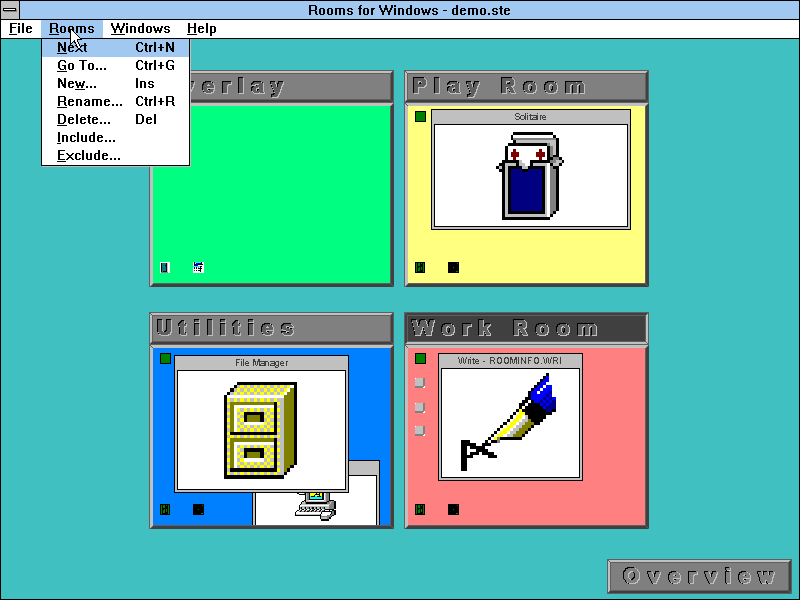 Rooms is not a complete shell replacement, but rather an extension that adds multiple desktops and enhances the functionality of the Windows 3.x desktop. 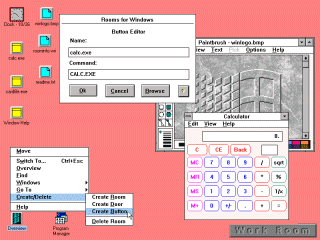 Each desktop is referred to as a "room" and is linked to other rooms using "doors". 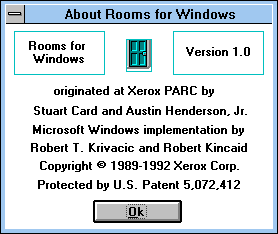 I had already covered Xerox Rooms for X Windows running under SunOS previously. Over all, the two are very similar. 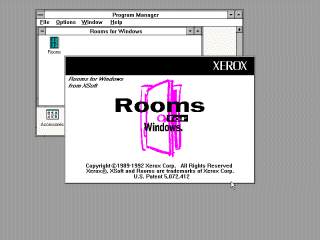 Xerox Rooms for Windows starting up. Normally you start Rooms like any other application from the Windows Program Manager. 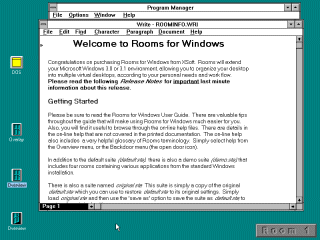 The documentation, however, stresses that you can also start Rooms with Windows from the DOS command prompt. 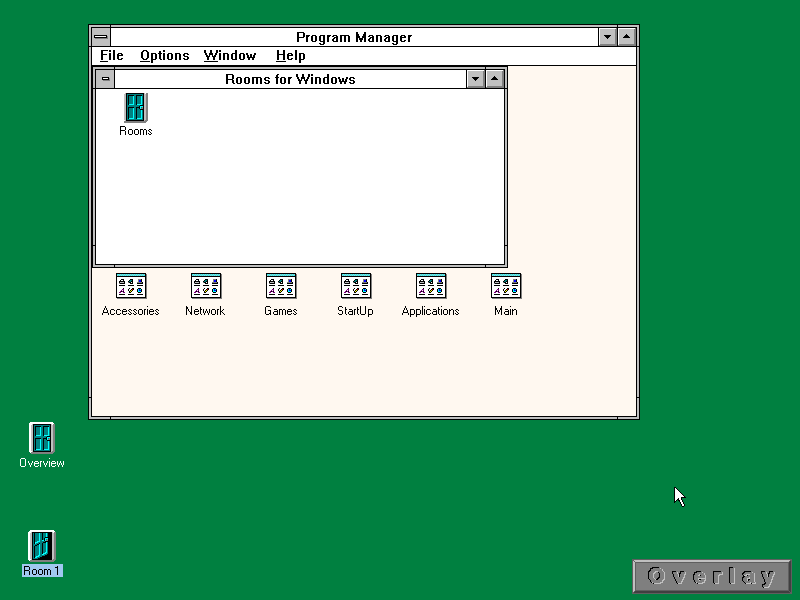 This is necessary because Rooms does not replace the program manager as the shell, and Windows 3.0 did not have a "startup" group like Windows 3.1 did. You can specify the room to start in, or the "suite" file to load as a command line parameter. By default it starts you off in the "Overview" room. This room graphically displays a list of all rooms in the "suite". From here you can add or remove rooms, and save or load a suite. 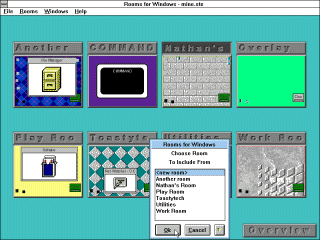 Each room preview in the overview displays a representation of each window open in that room. It is possible to move a window from one room to another by dragging and dropping the objects from one room preview to another. Double clicking on the room will take you to that room. A "Room" is a desktop that can contain open windows only visible in that room. 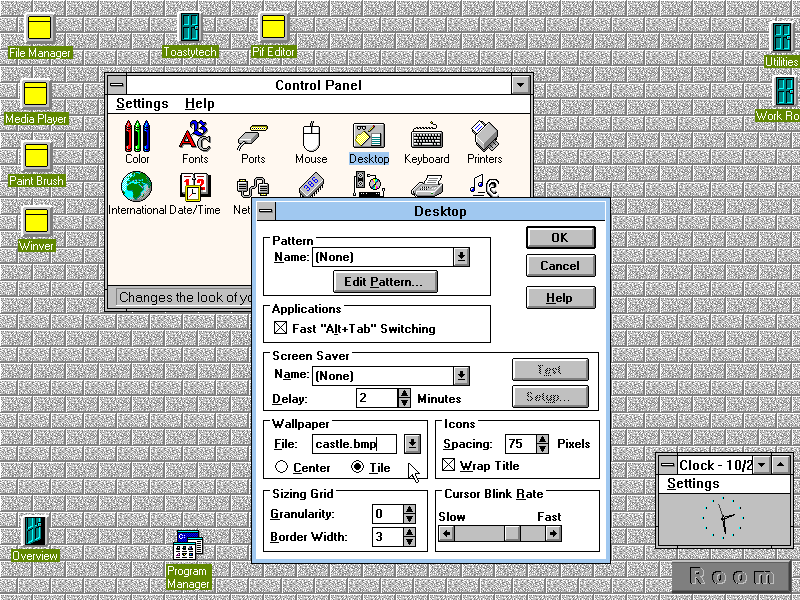 Each room can contain door, application, or document "buttons" directly on the desktop. Xerox Rooms can automatically start applications. 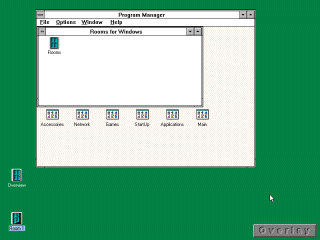 It also encourages opening many programs at once - which under Windows 3.x runs in to resource limits very fast. If you double click on a "door" icon, it will animate open, this waving character appears, and it takes you to another room. The door in the lower left is a "back door" that will take you back to the last room you were in. Additionally, moving the mouse to the edge of the screen and clicking will take you to the next or previous room. The Overlay room (not to be confused with Overview) is a special room. All windows and objects open in this room also appear in every other room. For example, if I open the Windows clock in this room, then the clock will be visible in every other room. By default Xerox Rooms puts the Program Manager in the overlay room. You can add as many rooms as you like, and save your configuration of rooms to a suite file. If you open an application in a room, and save the suite, it will try and open the application again next time. You can add custom buttons to the desktop. This lets you launch an application or a document directly from the desktop without the program manager. Setting up buttons is kind of tedious. They act like shortcuts and do not directly represent files. File management must still be done through Windows File Manager. Minimized programs icons still appear on the desktop. 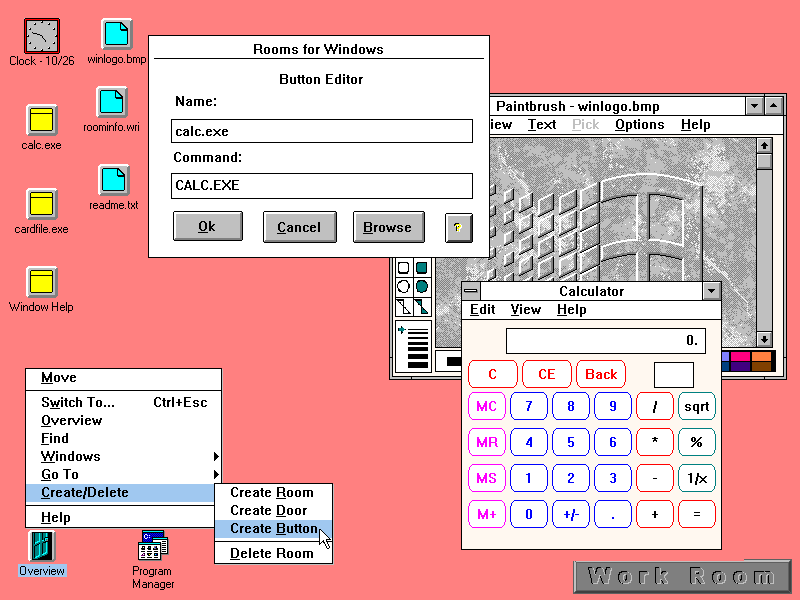 Even though the buttons are not minimized windows, clicking on them brings up a similar menu with similar terminology. For example, selecting "close" from a button's menu will delete the icon from the room without confirmation. Each room can have a different color or image for a background. Oddly, Xerox Rooms does not provide a built in method to change that. 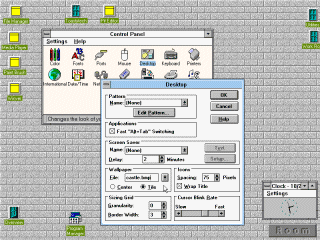 To change the background, you must open the Windows Control Panel in the desired room and use the Color or Desktop applets. 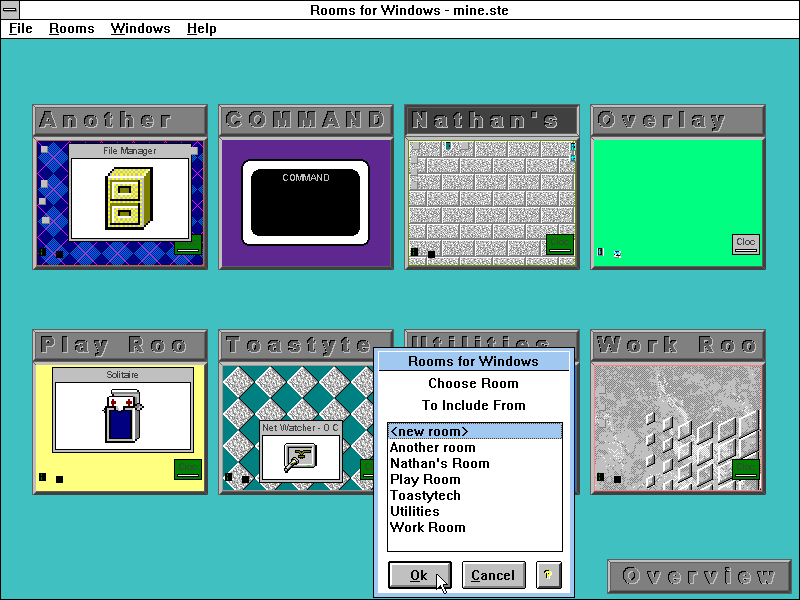 Similar to the use of the Overlay room, It is also possible to "include" windows from one room in to that of another. 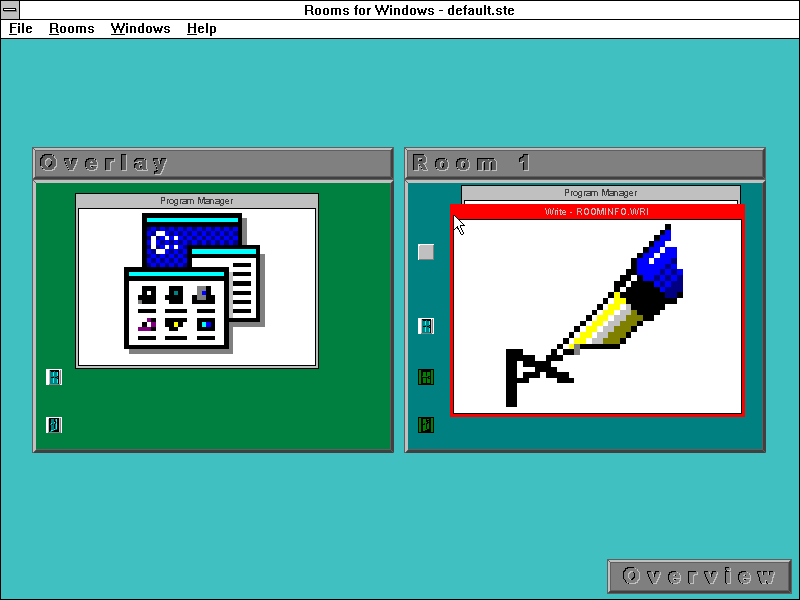 An interesting feature of the Windows version of Xerox rooms is that it can create a full screen room for a DOS application. Clicking on that room from the overview will switch directly to the full screen application. 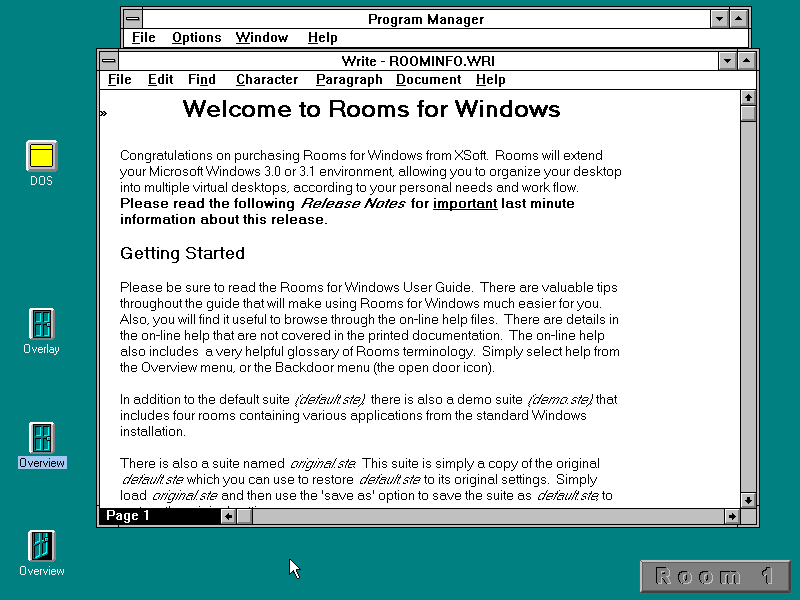 Exiting Rooms returns to the normal Windows 3.x desktop. Unlike Rooms for X, this version closes all open applications when exiting.